What treasures can you find in the streets of Japan and what discovery will you made on the markets of Germany? Here is a first overview of the different styles of street food in both countries. When we think of Street Food, we immediately have the image of some food cooked and sold in outdoor places to be eaten immediately. That being said, depending on where you are located in the world, recipes, meals and way of enjoying can drastically change! 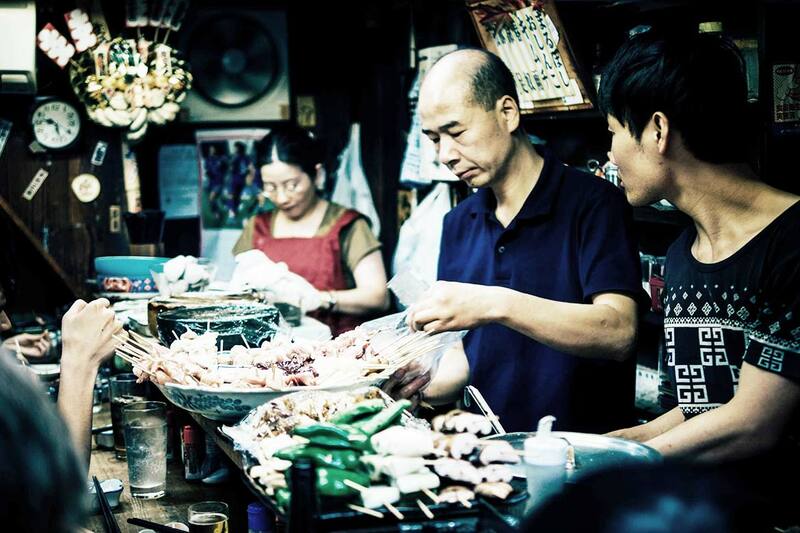 When it became a huge trend for the European foodies not so long ago, Street Food markets in Asia already were a very common thing for decades. The outside eating culture had taken over the worldwide food scene and we keep being amazed by where it is going. Street Food markets and trucks in Europe are largely inspired by Asian culture and cuisines have been customized each year even more, blending several influences and cultures in one plate. It is now easy to find an Asian burger, a vegan döner or some thaï tapas. Often cheaper than in a restaurant and quicker to eat, everyone now leave their homes and taste all the culinary wonders that exist in…the streets. Japanese Street Food is called yatai by the natives and is based on mobile food stands where people can get delicious specialties. Japanese Street food is a bit less known than that of other Asian countries, but it is very easy to find some bites wherever you will be hanging around. 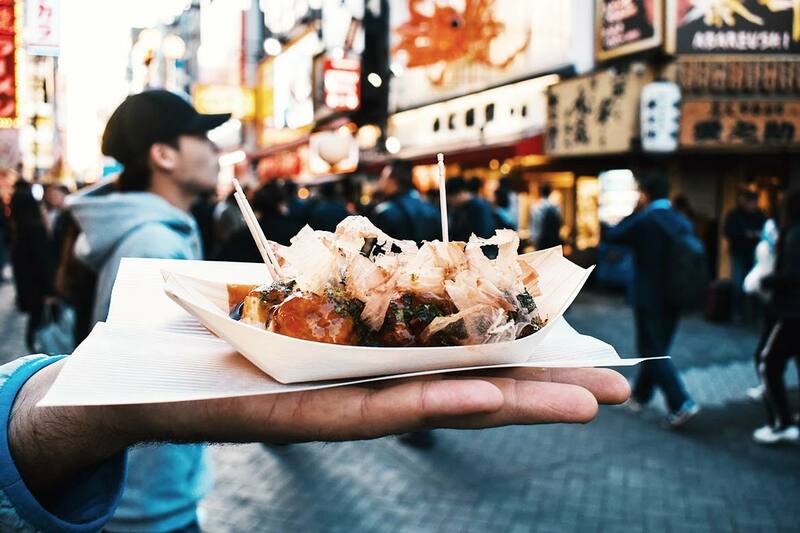 Especially Osaka has become THE city where to go to find the largest offer of Street Food! Gyozas are deep fried raviolis stuffed with meat and vegetables and served with soy sauce or brown vinegar. They are often served by 6 and never last more than 2 minute in a plate. 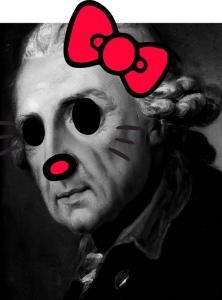 It is just too good! People find them served at Izakayas or ramen shops, but they also make frequent appearances at festivals and street markets. Gyozas are also well known in Europe. Takoyaki are very popular. The dish consists of small dough balls stuffed with small pieces of octopus, fried in an especially designed pan They are really delicious, but you should wait a moment before you eat them so you don’t burn your mouth. Don’t wait too long though! Takoyaki vendors are particularly present on the streets of Osaka, where the dish takes its origin from, but can be found pretty much in every Japanese cities nowadays. Yakitori is skewered chicken, grilled and brushed with sauce during or after the cooking. Usually, Yakitori places offer a variety of chicken sticks such as tsukune (minced chicken balls, egg, vegetables and spices) or negima (a mix of chicken and leak skew). This dish is very known worldwide and eaten in most cities in the world. Its is a very iconic Japanese recipe. Yakisoba is a dish initially coming from China. Ramen noodles are stir-fried with small pieces of pork and various veggies like cabbage, carrots or onions. This is a typical comfort-food dish and it is often topped with soy sauce. It gives the noodles their distinct tangy and spicy flavor. Just succulent. This plate is mainly eaten as a snack and ginger, Bonito flakes or onions can be added. Another culinary specialty is kushikatsu, an extension of tonkatsu. 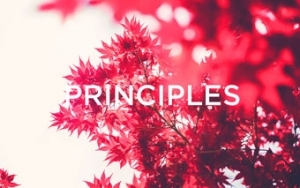 The principle is the same, the ingredients are breaded, but placed on small skewers of bamboo. 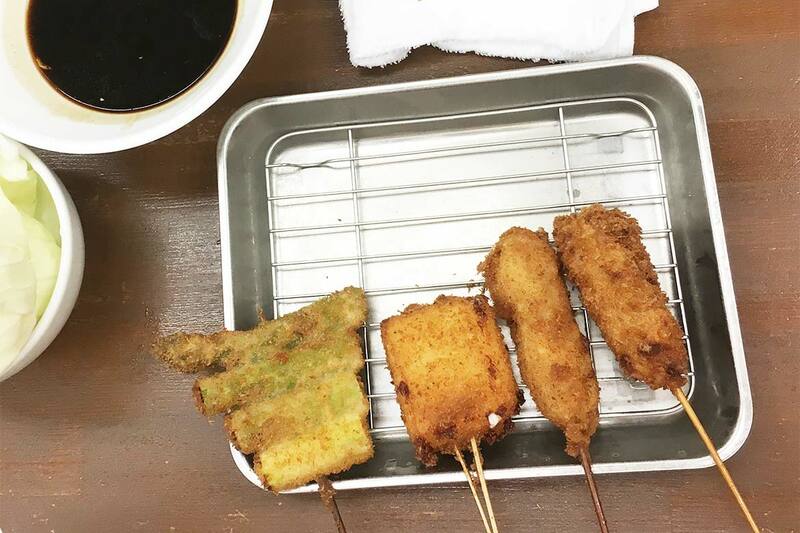 Kushikatsu is sometimes offered as “set” with skewers accompanied by salad, soup and rice. It is just simple and delicious. Sometimes you can even get okonomiyaki on the streets, often nicknamed as ‘Japanese pancake’ (because of its looks). The batter consists of flour, eggs, cabbage, as well as a variety of possible veggies and meat, all is cooked on a griddle. People add seafood, cheese, rice cake to make it a more savory snack. It is not only in Asia that eating on the street has a long tradition. In Regensburg, during the twelfth century, the stand “Garküche auf dem Kranchen” provided boiled meat to the workers building the cathedral. Today, it has been replaced by the Historische Wurstkuchl which is perhaps the oldest snack in the world! It consists of three Nuremberg sausages served in a small bun (Drei im Weggla). Some name it at least as the oldest German Street Food specialty! 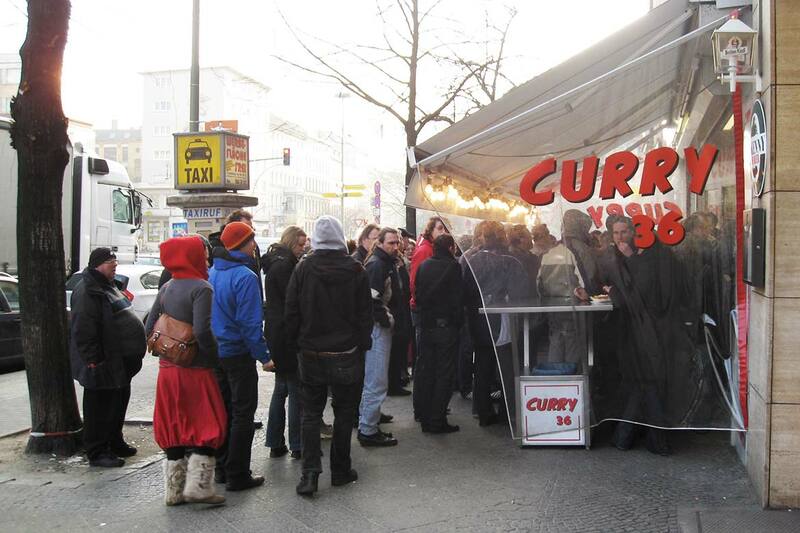 Speaking of which, we have iconic curry wurst that is one of the most representative and renown German food in the whole world. It can be found in every corner of the capital. The plate is a sausage served with fries and topped with a curry ketchup sauce. Every person visiting Berlin will try it, at least once and it is on every single food guide. Nonetheless, the traditional German Street foods was not always coming from Germany. Many traditional sausages were invented in Austria or Poland, but they became very German over many centuries. The current revival of sidewalk activities comes from the United States. It all started in the early 2000’s, in New York and the surrounding area, when the trend of the food trucks reached a significative peak. 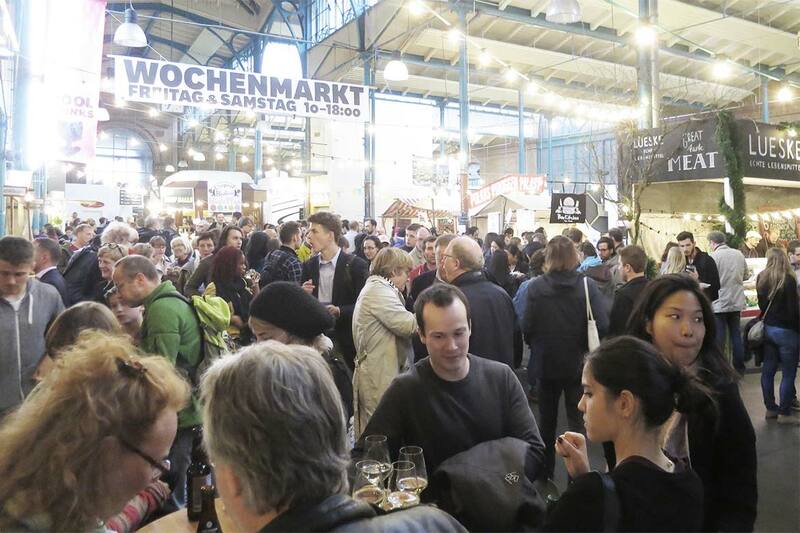 Since then, thousands of people are visiting “Street Food Thursdays” in the famous Markthalle Neun – the covered market in Berlin-Kreuzberg. This event type is also happening in other German cities with the same success such as “Street Food Sessions” in Hamburg or the “Street Food Festival” in Cologne. In Germany, most of the Street Food vendors offer international dishes coming from every corner of the the world. As for example the bánh mi of Vietnam, a baguette made from wheat flour and rice with grilled meat, vegetables and coriander or the gua bao, a Taiwanese variant of the burger, also very appreciated by the foodies. Don’t worry, Cheese spätzle and smoked pork meat are still part of the game and enjoyed on markets. French crêpes are also very popular everywhere! Since the 2000s, there are a lot sandwich shops, soup bars or regional burger restaurants in German cities and not only because it is easy to eat at lunch break. Street Food is now consumed as a new type of cuisine and it appeals to everyone for different reasons. Street Food markets are very democratic now and have become a place where people go for “dinner”. You know there will always be a lot of people, a great crowded atmosphere, not too high end nor snobby. During those street food events, the importance is given not only to the food but also to the way it is consumed. They have become also very trendy because they are perfect to take pictures for Instagram. time together. Local brands are taking part and present their latest products. In the street, only the pleasure of the palate reigns and the discovery of a genuine food tells a lot about a place, a person or a moment. Header picture by Agathe Marty and skewer picture by Lan Pham on unsplash. Picture of Curry 36 by Kai Hendry, the one of Markthalle Neun by Alper Çuğun – both under CC 2.0 license on flickr.